Fishy Tales by DK Readers – Fishy Tales is a non-fiction book with stunning photographs. Each two-page spread has a new sea creature to discover. Inside, you will find simple labeled diagrams of coral, fish, turtles, sea horses, starfish, jellyfish, sharks, octopus, crabs, rays, dolphins, and eels. Slowly add 1/2 cup of water until the moon sand is a crumbly texture but can hold form. To enhance the sensory experience, I played ocean sounds with seagulls from youtube. R loved running her hands through all of the different textures. a. 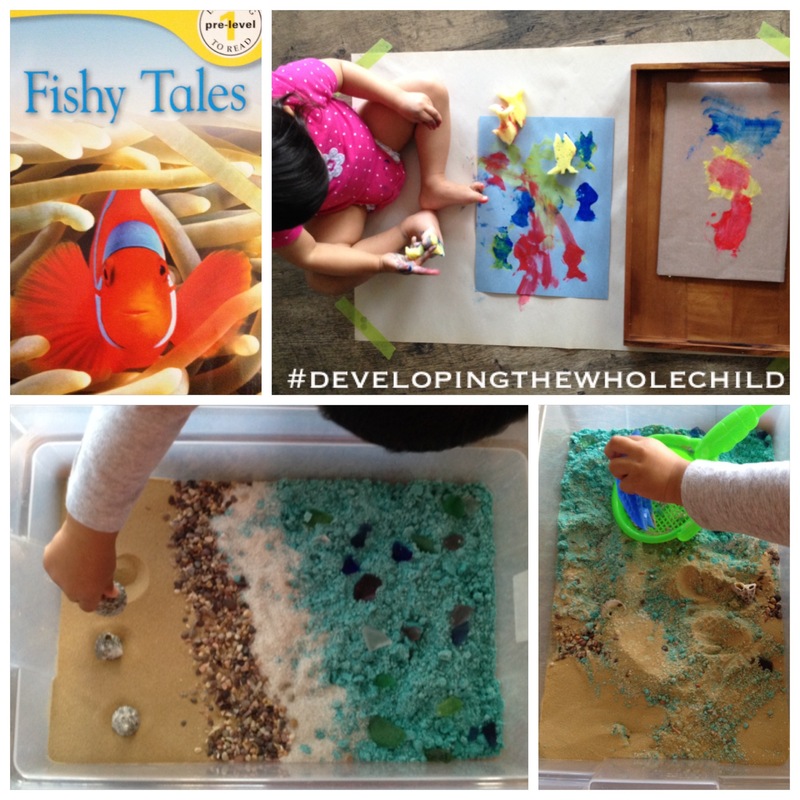 Add small ocean animals to encourage more imaginative play. b. 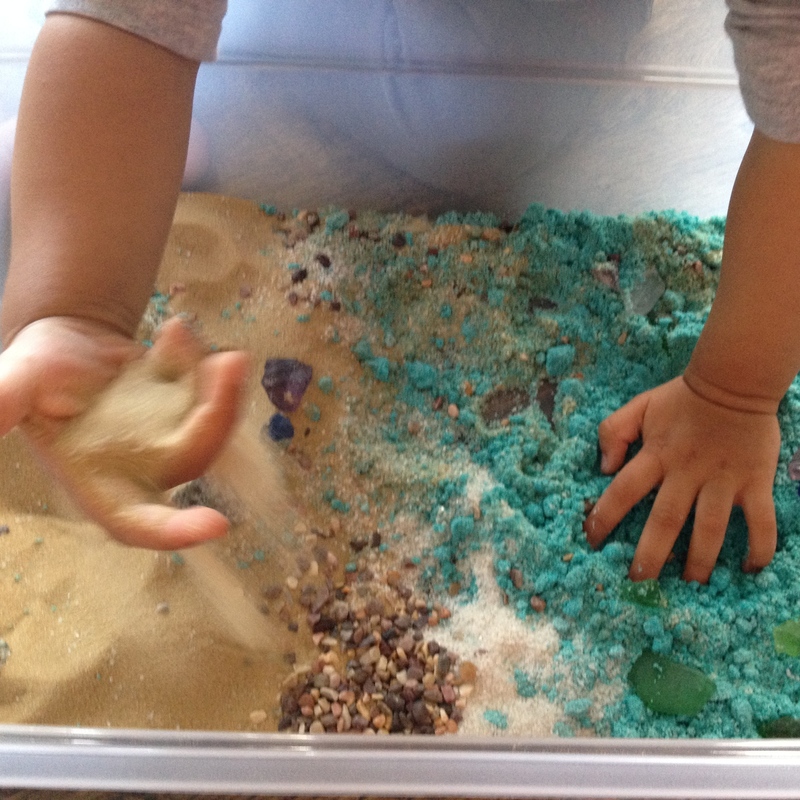 Have the child sieve the rocks into another container to separate them from the sand. I cut a sponge into fish-like shapes. We used red, blue and yellow paint to continue to explore the primary colours and stamped away. R still prefers smearing to stamping, but she had fun; especially when she got to smear the paint on her feet. 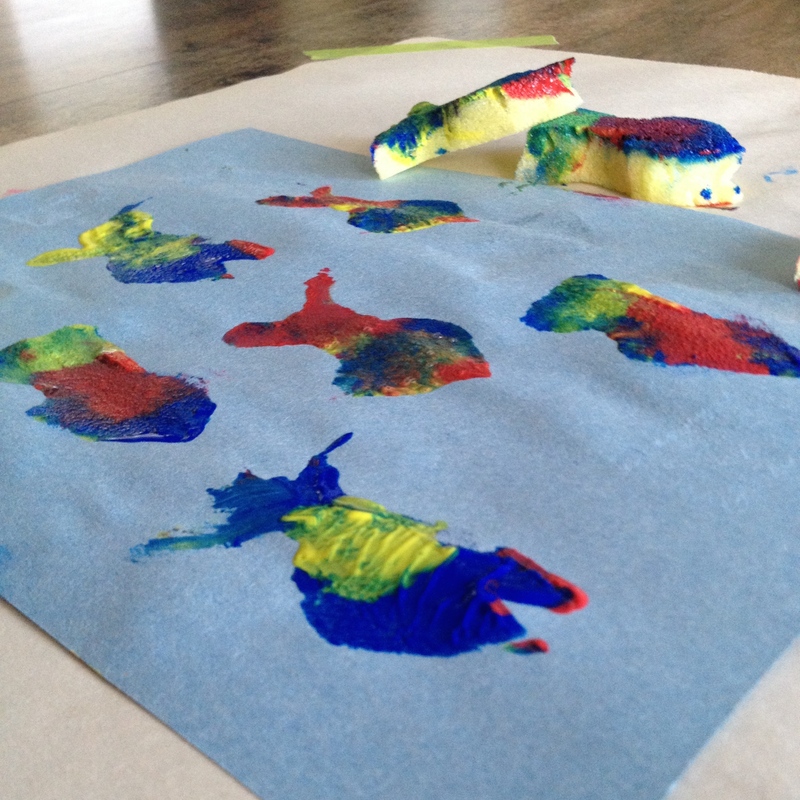 Painting often becomes a sensory experience for R since she loves the way the paint feels on her hands and feet. On days where I want to contain the mess, I have her paint while she is sitting in her high chair. Today, I felt like letting her go at it and make a mess! After having a rough weekend being sick, she totally deserved it! Thank you for the advice!! I will edit that for sure. I’m still trying to get a hang of wordpress so any advice is welcomed and much appreciated! You’re welcome. 🙂 I know, there is so much to learn about WP!